I just mentioned that I bought some apple cinnamon instant oatmeal and was surprised at how much added sugar it had. I was trying to cut back on the time it takes to make a bowl of oatmeal in the morning and tried the instant oats. It was a disappointment. I like my oatmeal creamy and these tiny dried flakes just couldn’t deliver, no matter how long I cooked them. But I found a way. 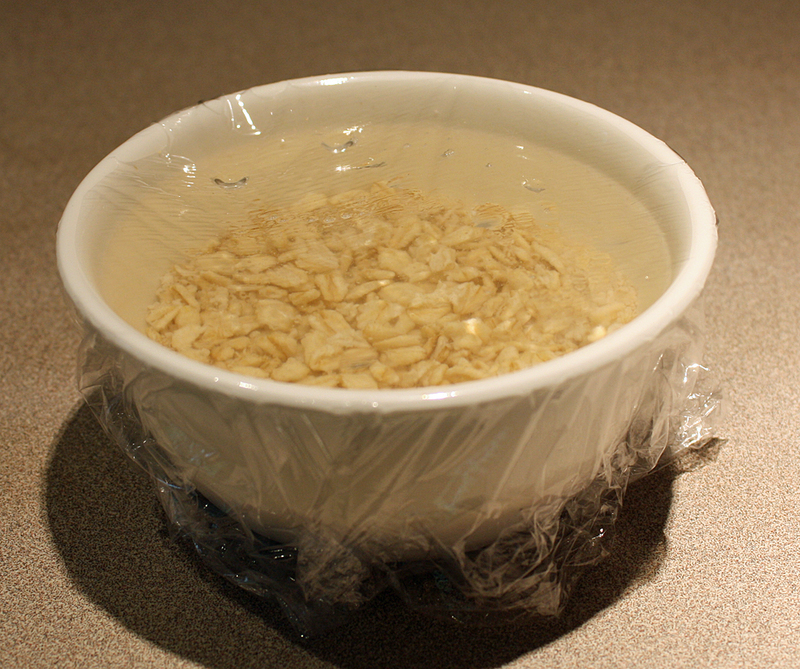 I soak some regular rolled oats overnight and they cook up in a few minutes in the morning. You just have to remember to soak them the night before. Salt breaks down soluble fiber and will make the final product watery. Salt added early will dissolve and you’ll end up adding more later for taste, more that you don’t really need. These are the same oats after less than 5 minutes simmering on the stove. 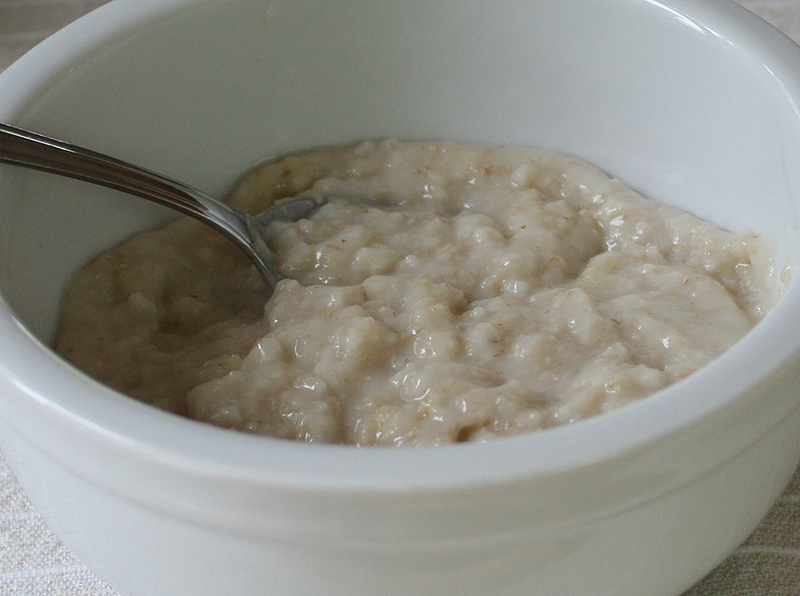 You just can’t get instant oatmeal this creamy. You can’t get regular oats this creamy either unless you cook them longer. Soak, and you have the best of both worlds. What you see above is just plain oatmeal. There are endless variations. You can substitute almond milk, soy milk, cashew milk, rice milk, apple juice, or an applesauce/water blend for the water. You can add dried fruit like raisins, chopped dates, cranberries. You can spice it with cinnamon. Add maple syrup or sugar while it’s heating. Add fresh fruit as a topping. I add a few teaspoons of oat bran in the overnight soak too. Some people eat this cold right out of the fridge in the morning but I like to heat it. One tip: the cinnamon will blend in better if it’s heated. This entry was posted in Uncategorized on May 23, 2016 by Bix. Virginia just emailed that Vitacost.com is having 20% off a $50 food purchase. You can get the extra thick rolled oats there, great for making granola. Great selection of rices too. Yummo. And thanks for the good info re the salt. I had a bag of corn grits that I was trying to use up. I tossed a few teaspoons of them into the oats at night. They all cooked up great the next day. When I’ve cooked oatmeal and grits together before, without soaking, the grits often stayed too gritty.